The web of deceit and lies continues to grow among the most sinister government workers who are a part of a cabal to take out president Trump. Now, FBI sources revealed that hours after the FBI found classified Clinton emails on Anthony Weiner's laptop, Peter Strzok’s wife was promoted to a powerful position in the SEC. 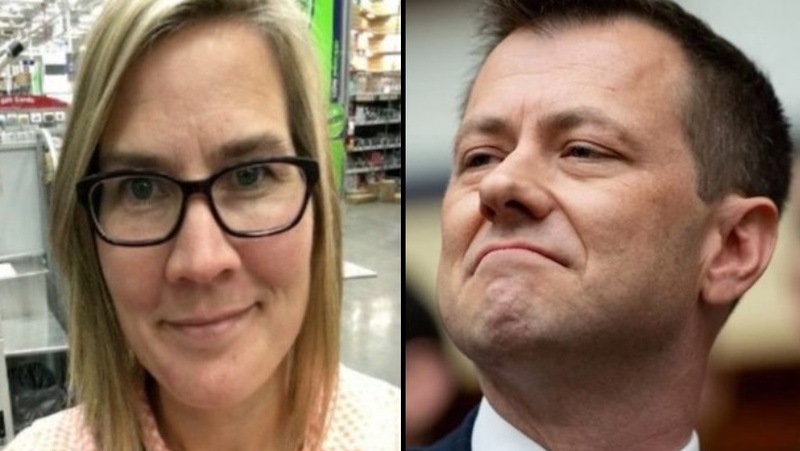 Immediately after her promotion, Strzok's wife Melissa Hodgman began stonewalling all criminal proceedings against the Clintons. FBI sources, the Inspector General, and the House Intelligence Committee all determined that Peter Strzok and his wife Melissa Hodgman were instrumental in protecting Bill and Hillary Clinton from prosecution for their multiple crimes. Melissa Hodgman's promotion to deputy director of the Securities and Exchange Commission's Enforcement Division took place within hours of Strzok and FBI Deputy Director Andrew McCabe being read into the situation with the Clinton emails. True Pundit reported, "The FBI’s original warrant for Weiner’s laptop was issued in late September 2016 and a subsequent warrant was issued on Oct. 30, 2016, so that the FBI could use Huma Abedin’s & Hillary’s classified emails as evidence in the re-opened Clinton probe." It is no coincidence that Hodgman was promoted Oct. 14, 2016, which is hours after US Attorney Preet Bharara reported to McCabe and Strzok that evidence related to the Clinton email case. Within 36 hours, Hodgman was promoted in the SEC raising questions of the timing and nature of the promotion due to its proximity to the Clinton investigation. Wall Street Journal reported, "The latest development began in early October when New York-based FBI officials notified Andrew McCabe, the bureau’s second-in-command, that while investigating Mr. Weiner for possibly sending sexually charged messages to a teenage minor, they had recovered a laptop. Many of the 650,000 emails on the computer, they said, were from the accounts of Ms. Abedin, according to people familiar with the matter." Just two weeks after Hodgman's promotion, the FBI obtained an additional search warrant to use Hillary and Huma emails from the 650,000 emails stored on the computer as evidence. Strzok himself has been the focal point of recent allegations of misconduct based on his bias against president Trump. Now, with Strzok's wife being promoted to a top-level position in the SEC, she has full oversight of securities and financial crime cases and which of these get forwarded to the FBI or DOJ for prosecution. An FBI source told True Pundit, "There are no coincidences here. Not with this crew. They wanted his wife in that SEC slot for a reason." That reason was likely the "insurance policy" that Strzok referred to in his private text messages to FBI lawyer mistress Lisa Page. Where is the special counsel to investigate the corruption behind the Hillary investigation and now also the investigation against Trump? THEN YOU ARE AN ACCOMPLICE TO THE HORRIFIC CLINTON CRIMES AGAINST HUMANITY! well more light of day comes out! BUT! nothings going to get done! never does never will unless its some low level smuck that gets sacrificed! media congress and im beginning to believe potus are complicit! potus has ability to bust tbis wide open BUT doesnt want to get involved! go figure!!!! im thinking about writing sue on life below zero and see if she needs help or a husband! You have no idea joe what pain is coming their way. Remember I said this to you this 23 of July. How long, buddy? One week? One month? One year? Ten years? Because Killary is 70 years old and doesn't appear to be in the best health, so in ten years, she may not even be around. I agree with other poster… Trump and Sessions have their fingers in their asses on this investigation. It almost makes one wonder if they are part of the swamp, as well.